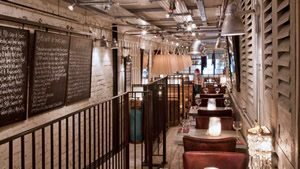 Do you manage a restaurant near Lyceum Theatre? Click here to contact us and get listed. Bill’s restaurant literally shares the same building face as the Lyceum Theatre! You could finish up your meal at 7.25pm and still make it to the theatre in time for curtain up. Not only that, but Bill’s is genuinely delicious! Dishes have a slight Grecian and European flair such as fresh fish, mezze boards and a halloumi dishes speckled across the menu. I can personally thoroughly recommend the mezze board and the king prawn skewers from the “lighter mains” section, which leaves you satisfied but not too bloated! For those looking to make a real night of it, Bills serves fantastic cocktails such as their own blend fruit bellini as well as some devilishly tempting desserts, including a “Lemon Meringue Pie Cheesecake”. For those enjoying a matinee show at the Lyceum Theatre, Bills’s offers a fantastic afternoon tea with all the trimmings - a delectable treat. Call 020 7836 8368 for reservations and further information. For lovers of Indian food, Masala Zone serves up traditional Indian dishes with a contemporary flair. The restaurant, situated on Floral Street in Covent Garden, is celebrated for its thalis – a large platter with a variety of different vegetable and meat dishes of different flavours. These platters are reasonably priced for the amount of food they provide. Call 020 7379 0101 for reservations and further information. 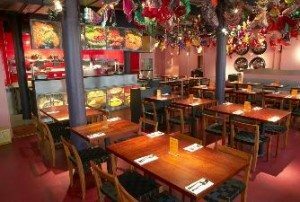 Wahaca brings the vibrancy of ‘Mexican street food’ to London, with a branch just around the corner from the theatre. The menu features a range of dishes, from £4.25 for tapas style street food, to £7.70 for bigger plates. There is also an excellent range of cocktails and flavoured tequilas for those looking to make a real night of it! 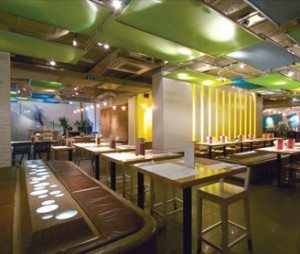 Situated close to the Lyceum Theatre on Chandos Place, Wahaca is bright and energetic and would make a perfect post-show treat. Call 020 7240 1883 for reservations and further information.